There are plenty of condos available in South Florida, they are just waiting on buyers to emerge. 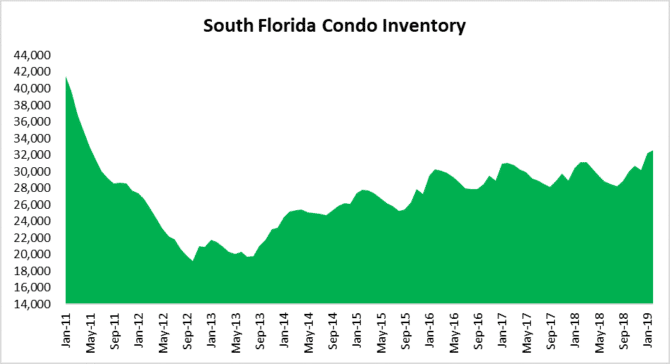 The current inventory from Miami to Palm Beach has reached a level we haven’t seen since we emerged from the housing crisis. In February there were 32,578 condos available for sale. This is the highest inventory since June 2011 and does not include all of the new construction units that are often withheld from the Multiple Listing Service. If transaction volume perks up this spring, much of that inventory could disappear. However, if sales volume remains sluggish throughout 2019, inventory will continue to build and price declines will continue. The pace of sales has been sluggish for the first few months of 2019. We have repeatedly mentioned how June of 2018 was the peak for the housing cycle. in particular, we focus on the tri-county market of Miami, Fort Lauderdale area and Palm Beach County. In June there were 4,353 closed sales in the tri-county condo market. Traditional sales volume declined 32% to 2,949 closed sales in February. You will notice from the chart there was a slight uptick from the January number of 2,611 closed traditional sales. Here is another look at the total condo transaction volume since 2012. 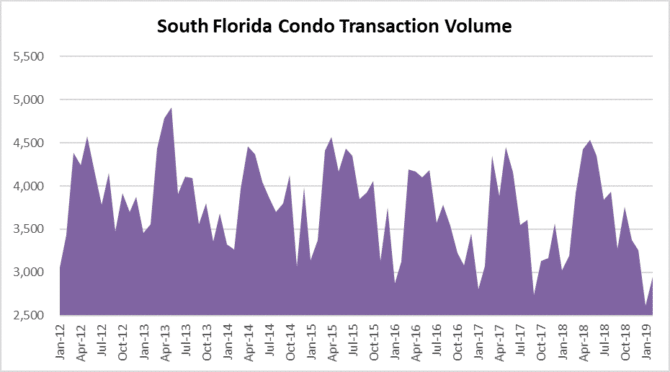 The chart has plenty of peaks and valleys with the lowest point this past January with only 5,113 total condo transactions. To put this in perspective, we haven’t seen volume so low since we started charting in January 2102 following the last condo crash! Sluggish deal volume isn’t just a South Florida issue. Reports of slower sales and lower prices have been making news lately. 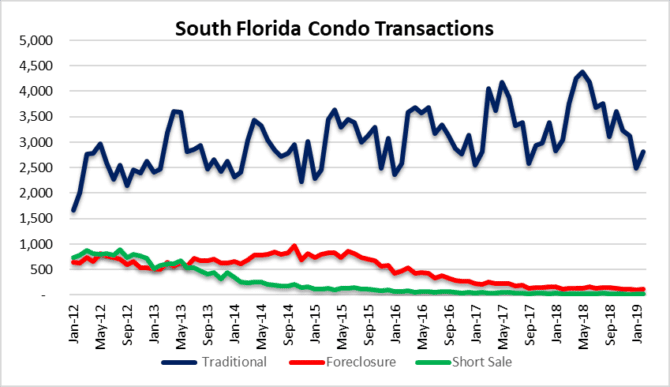 Looking at the median sale prices by transaction type, you will notice that traditional sale prices have declined since June, but foreclosures and short sale prices have increased. 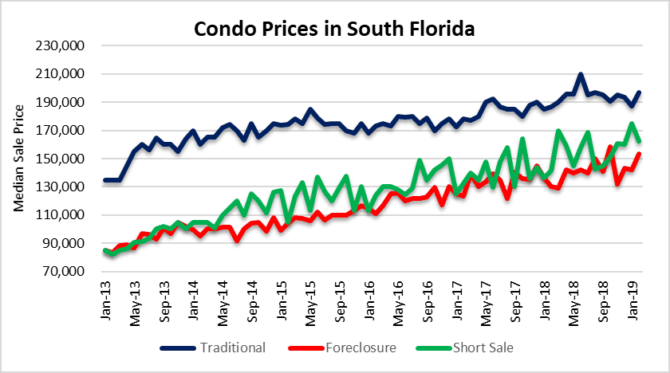 This entry was posted in Condo market, South Florida Real Estate and tagged condo prices, Fort Lauderdale condo market, Miami condo market, Palm Beach condo market. Bookmark the permalink. Both comments and trackbacks are currently closed.